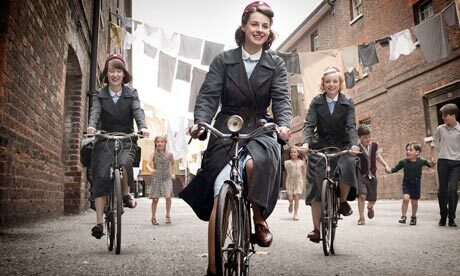 Have you seen the brilliant show Call the Midwife from the BBC? It is stunning. The show is set in the (very rough) East End of London in the late 1950s. It's based on the memoirs of Jennifer Worth and follows a group of midwives in their never boring day-to-day lives. Every episode I've seen has made me either tear up, or flat out cry. Like all BBC shows, it's expertly done with gorgeous costumes, period details and cinematography. A few things that really got my attention: In the show, you see sitting babies left alone in prams all over the place! They're just looking around, or crying a bit, but no one is in sight. And the show's producers don't hold back on portraying the poverty of the time and place. Filth and squalor in HD. It will make your jaw drop. Below is one of the opening lines from the very first episode. Midwifery is the very stuff of life. Every child is conceived in love - or lust. And born in pain, followed by joy. Or by tragedy and anguish. Every birth is attended by a midwife. She is in the thick of it. She sees it all. I love this show! But I made the mistake of watching season one when I was 5 months pregnant and season 2 in the weeks leading up to R's birth. Wouldn't recommend it to any preggos, wait until baby is born!